Training in the plumbing industry will prepare you to become a plumbing technician, apprentice or state licensed plumber. You’ll serve a wide array of clients with commercial, industrial and residential properties. You possess the right knowledge and skills required for installing or maintaining various types of water systems. Not only that but you’re also responsible for the repair and installation of some fixtures like sinks, shower heads, and even water-using appliances. As a technician, you’ll have the duty to diagnose plumbing issues and guide customers toward a confident decision. For example, if someone needs an immediate water heater repair, a plumber will respond to their needs very quickly. Once you decide to take a more specialized approach to plumbing training, you’re then you may prepare yourself to become a pipefitter. With the help of a wide variety of skills including plumbing safety and installation methods, you’re duty-bound to perform maintenance and installation of piping in power and industrial plants. As a pipefitter, you need to monitor power generation systems as well as the heating/cooling systems. You will also work on the system installations for automated controls to regulate the configurations. The training for steamfitters is similar to the training intended for pipefitters. However, the only difference is that you need to take a specialist training to become a certified steamfitter. The biggest part of this job is the installation of pipes for the transportation of high-pressure gas materials. Another specialized type of pipefitters are the pipelayers. Once you finish your training, you’ll be in-charge of some major pipe works. You dig and level the trenches for the pipes and then lay those pipes in the trenches. Remember, the pipes you’ll be working with are used to carry drainage, water, gas and sewer systems. Also, these pipes are made of various materials including clay, cement, iron, and clay. When it comes to delivering gas all throughout a site, a qualified gas technician will be the responsible person for the job. Homeowners and business owners will call for a gas technician to fix and replace faulty equipment. With a specialized equipment, you will conduct a search for gas leaks and more importantly, perform tests about displays and other control mechanisms. In other words, these professionals have specializations in gas mechanisms – related systems. The plumbing industry also needs project managers who will be responsible for supervising a group of employees in the company. If you want to hone yourself as a manager, you may need to go through a special plumbing course to learn some management skills. In most cases, a plumbing manager will oversee the day-to-day undertakings of their members. You will also make sure that all employees are doing their jobs well without compromising the quality of their work. Moreover, the pay intended for managers are higher than the regular workers. Many plumbers transition into owning their own companies. Being a business owner, you have to undergo extra training sessions in all plumbing areas to be knowledgeable and skillful about all practices. As an owner, you have a huge responsibility to ensure that all your plumbers possess the right combination of expertise and skills to get the jobs done. Also, you may require yourself to go through some business management courses to make sure you get a successful operation of your business. Lastly, you’ll be in charge of all the employees within the company to carry out their specializations in the plumbing field. There are a great range of plumbing opportunities that are available to those that want to pursue plumbing as a career. With so many people retiring in the workforce every year, by choosing to be a plumber you have a bright career path ahead of you. Due to a variety of reasons causing a high demand in the skill trades, there’s a dire need for young and proficient plumbing professionals making it a perfect career option to take after your graduation. By considering the different kinds of career paths tackled in this post, we hope you’ll find the right plumbing profession that best suits your future. 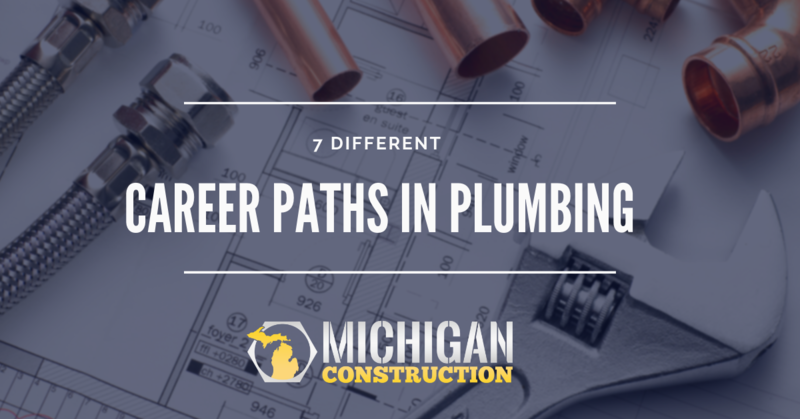 Make sure to check out all of the training and education resources that Michigan Construction has to offer on our Plumbing Career Details Page or check out our article on How to Become a Professional Plumber.